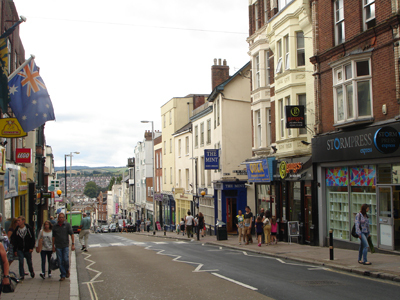 Exeter is a smaller version of Bristol without the attitude. Or rather it has the comfortable, complacent sense of a town which has done well for itself. Sited at the head of the Exe Estuary, quite close to the sea, it used to be a major port but doesn’t feel like that. Rather it is the cathedral town of a very large, very rural and very beautiful county. From the centre you can see rolling green fields. The harbour is now leisure incorporated, the estuary full of yachts and dinghies. At Dawlish you meet the English Riviera and Brunel’s line runs spectacularly alongside the sea and sands with exotic, strikingly bright sandstone outcrops – make sure you sit on the seaward side of the train. Arrival at Exeter is slightly disorientating as Brunel was not customer-focused and sited his station inconveniently outside the town at St David’s. However this is a compact city which usefully has a very comprehensive pedestrian signing system showing the walk time to your destination (the timings are very conservative for the reasonably able bodied so you will never miss your train). Thomas Sharp: ahead of his time? 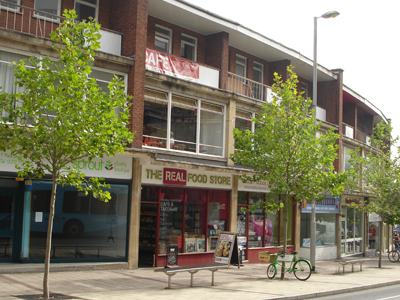 The city centre is sited on a hill north and east of the Exe. This was a Roman city and the Roman cross roads is still clearly visible, as are the originally Roman walls in many places. The medieval town confined within these walls grew into a very densely built up place, as is dramatically shown in the wooden model of C18th Exeter on display in the excellent museum. It was only at this time that development breached the walls. There was significant development in the C19th and early C20th but the really big event was the Baedeker raid of 1942. 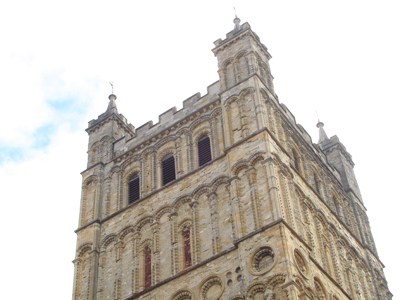 Pevsner says ‘the German bombers found Exeter primarily a medieval city; they left it primarily a Georgian and early-Victorian city’. 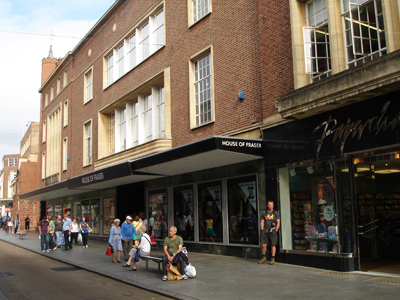 The Blitz destroyed about half of Exeter's historic buildings and much of the commercial centre. 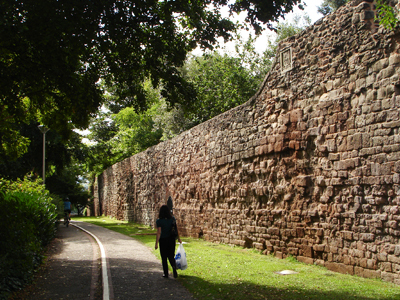 But as in Coventry and Bristol the process of destruction of the medieval city began long before the war. 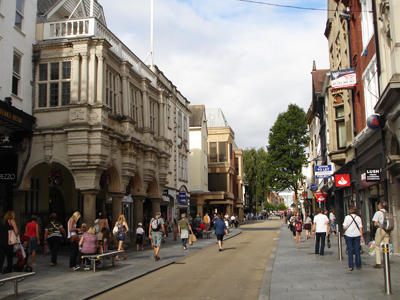 Thomas Sharp, the city's post-war town planner, challenged the romantic view of pre-Blitz Exeter as a medieval city, ‘the jewel of the west’. He saw the issue as being the city’s medieval mind-set and maintained that actually there had been ‘hardly more than half a dozen medieval buildings excluding churches outside the Cathedral precinct’ although the street pattern of course remained largely medieval. 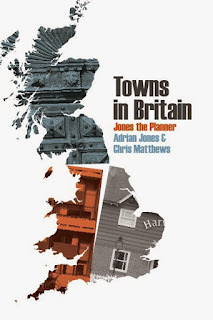 If Ian Nairn was a town planner? Sharp was a gifted planner, something of a renaissance man, who had uncompromising and usually intelligent and insightful views on just about everything. 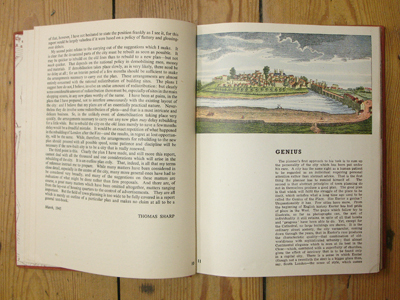 His book Town Planning, published by Pelican in 1940 was a best seller in which he challenged the Garden City movement, arguing for a clear distinction between town and country. His ‘Exeter Phoenix’ plan published in 1945 is an absolute pleasure to read, so different from the mealy mouthed platitudes in most plans today. He argued vehemently against rebuilding in a pastiche medievalist style as a thin veneer to otherwise standard modern buildings, something which was seriously proposed at the time. This no doubt would have been much more popular with the public than his concept of rebuilding in an unashamedly new and modern style reflecting the times but in a way which was sympathetic to the character and scale of the old city. 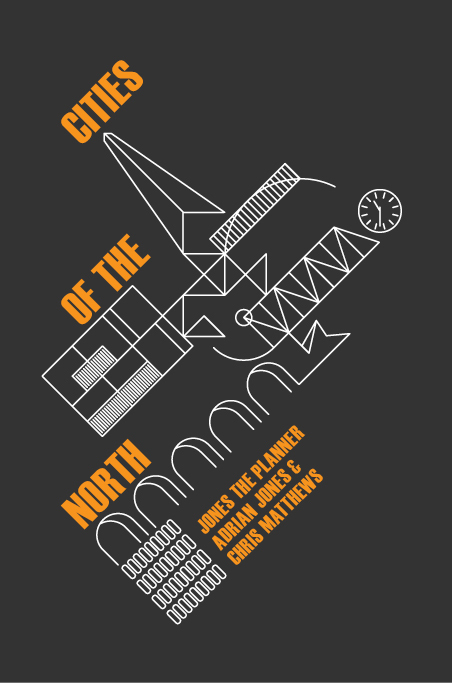 His plan was well researched and argued, strong on what we would now term urban design and it anticipated by decades the ‘civic trust’ school of renewal. 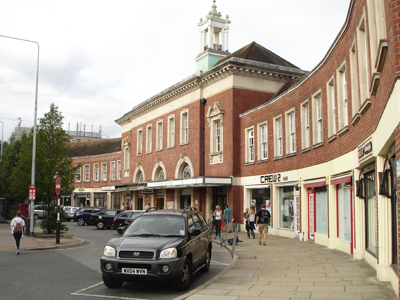 However his ideas were dumbed down and poorly executed, particularly in the rebuilding of High Street. 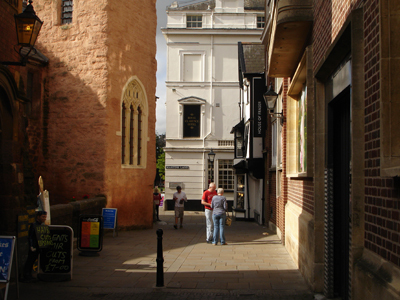 Thus the romantics won the battle of popular perception and Exeter became accepted as one of Gavin Stamp’s ‘lost towns’. But despite the Luftwaffe, the reviled planners and more pertinently the greed and ignorance of developers, there is still a lot of picturesqueness around. In fact the 50s rebuilding is what stops the city centre being entirely cosy and cloyingly retrospective. That and the 1970s Guildhall shopping centre which is like a cold plunge after a sauna of picturesqueness. The heart of picturesque Exeter is of course the Cathedral and its expansive green, right in the centre, not tucked away behind cloisters and closes but just off the High Street. Externally it is not particularly exciting with its rather squat Norman towers but the C14th nave is fantastic, the longest stretch of Gothic vaulting in the world. 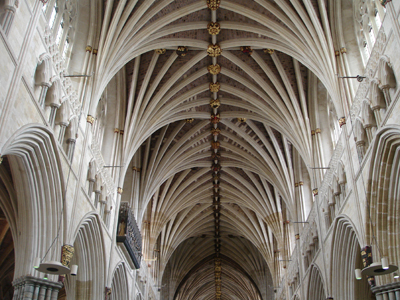 To quote the Shell Guide it is ‘like entering the belly of a whale: pillars and roofs are grooved and vaulted like the thews and sinews of an anatomical drawing. The Beer stone is of an exquisite soft colour; grey and cream in the nave, pinker over the choir from the reflected colour of the glass.’ You can really appreciate this cathedral as great architecture, not losing the point with distracting monuments and ephemera which I often find I do. Cathedral Green is very much that, a green lung for the city centre, bordered by a happy, eclectic mix of mostly Georgian and Victorian with hotels and restaurants more evident than Barchester-like sinecures. This is a Beautiful Britain photograph – just what the punters ordered. Only the extremity towards South Street tells of the Blitz and the rebuilding here is far from Sharp’s vision, more like you would find on any post war housing estate. Just north of this is the Roman crossroads and what should be the climax of Exeter, but it is a real anticlimax, part florid commercial Victoriana but mostly 50s rebuilding at its drabbest and dreariest. Actually the rebuilding of South Street, pretty much all destroyed in 1942, gets better and as Bridget Cherry says; ‘ there is at least a clear expression of post war aesthetics. …. less pretentious, and so more satisfactory than the rebuilding of High Street’. Fore Street, which slopes dramatically towards the Exe Bridge, looks very run down, but then it was when Sharp was writing. It retains some interesting buildings, sometimes like the C15th Tuckers Hall hidden behind later rebuilding of elevations. 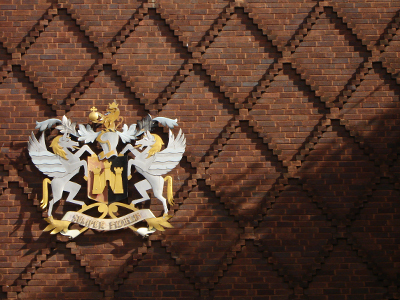 It also includes the rebuilt Corn Exchange which Bridget Cherry not unfairly calls a ‘tatty effort’ but I rather liked the strong diamond patterned brick façade with civic crest. 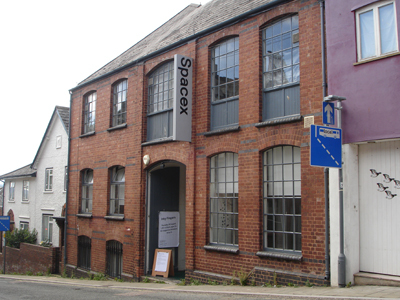 Fore Street appears to be the focus of Exeter’s alternative culture, certainly the best place to get a tattoo. To the north is a surviving fragment of the warren of lanes which characterised the pre Blitz city. Here is the small but intriguing St Nicholas Priory begun by the Normans. 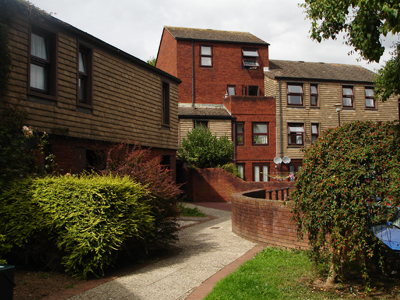 Around its garden is some pleasant social housing. 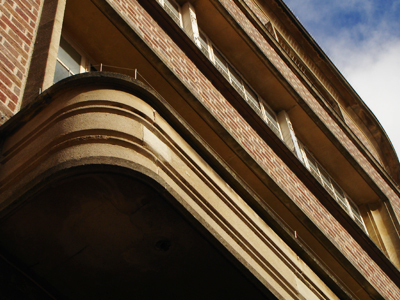 Bartholomew Street brings you back to North Street and the uncompromising face of the 70s Guildhall Shopping Centre. 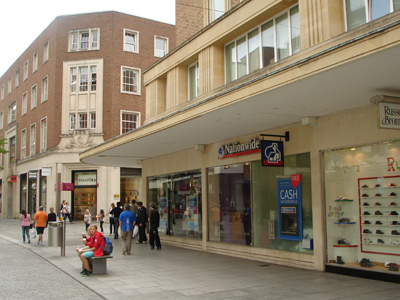 From High Street and Queen Street this hides behind surviving buildings or at least their facades, most significantly the façade of the very fine, very severe, neo classical Higher Market of 1834. 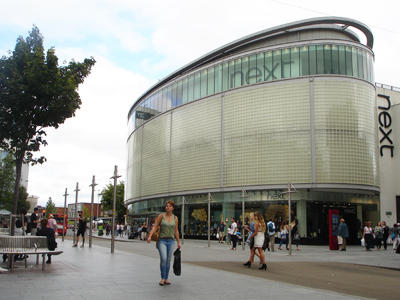 But the shopping centre itself is entirely dismal and it is in a sense the honesty of its appearance to North Street, where it just expresses its monolith structure without pretence to street scene or any attention to levels, that is more impressive. It does murder North Street though. The west end of High Street largely escaped the bombs and is an mostly attractive assembly of buildings, some from the C16th and C17th century and many reflecting the narrow medieval plots in their proportions. Here it is easy to find the Guildhall as its late Elizabethan front, which Pevsner calls ‘as picturesque as it is barbarous’, projects on granite columns across the pavement. 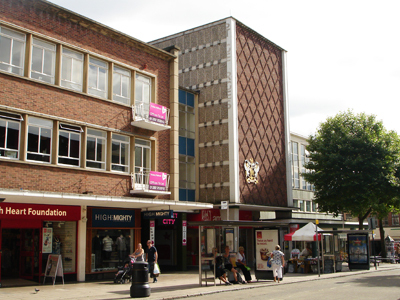 But if you really want barbarous, try Sports Direct on the corner of Queen Street, a brick cube of 1971 which Bridget Cherry notes as ‘ruthlessly austere …. a classic example of the insensitive arrogance of urban design at the time’. A decade later M&S was desperately trying to make an effort on the opposite corner with strong vertical elements and a lantern, although its apologetic brick wings are hardly more successful than Sports Direct. Beyond Queen Street, High Street was flattened and its rebuilding did not adhere to the design principles Sharp had set out. 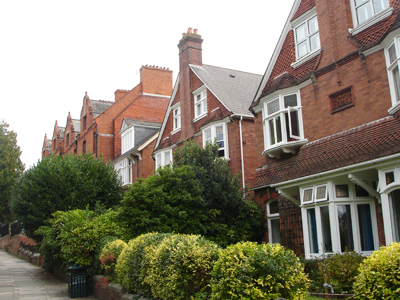 Pevsner says ‘one is plunged into a mediocre post war world, long dull ranges, brick with stone trim, horizontal emphasis ….. a total break with the character of the old town. The buildings are neither confidently modern nor skilled in their use of the occasional pinched classical detail.’ True dat, and widening the road was a visual disaster. The new John Lewis tower now closing the vista hardly helps. However it is still possible to find some satisfaction in noting the weak interpretations of modernism and the motifs and reliefs of the 50s stuff which at least indicate some creative spark and care in design. Working with the existing townscape. Am I in Copenhagen? ... see what I mean? More good Festival of Britain stuff. 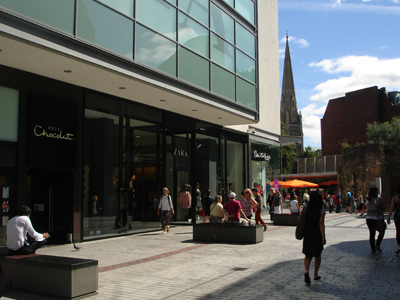 Exeter has received a lot of plaudits for its new Princesshay shopping centre completed in 2007. This is a redevelopment of a 1950s shopping precinct, itself built on the ruins of the exquisite Bedford Circus, destroyed in 1942. 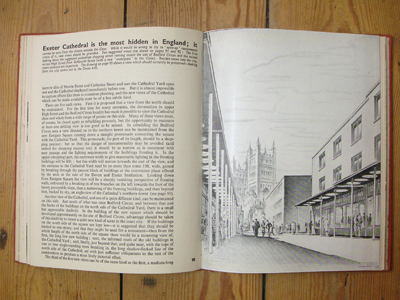 The car-free precinct was the first in England and seen at the time as a Phoenix risen from the ashes. The initial plans for its redevelopment received a lot of criticism and the developer, Land Securities, creditably rethought the scheme as a different animal, or a different breed at least – a shopping centre without doors. 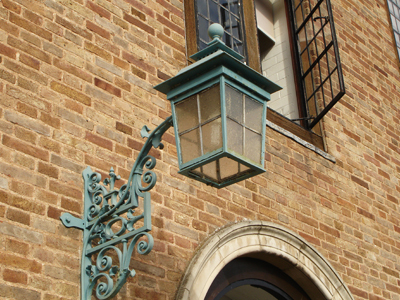 Chapman Taylor were the lead architects (and this shows in places) but Wilkinson Eyre, Panter Hudspith and ADG were also commissioned. 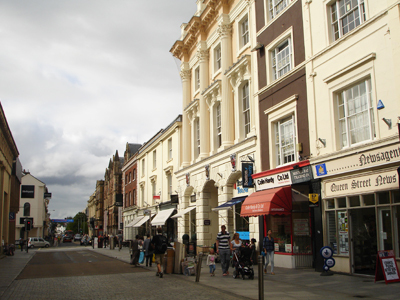 The site lies between the post war redevelopment of High Street and Paris Street and the Cathedral, largely within the walls which are exposed in places. 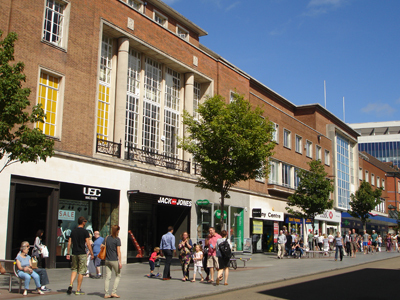 What is really good about the scheme is how the streets and squares connect and relate to the rest of the town, making for a complex townscape, quite the opposite of the banalities of Westfield and their ilk. 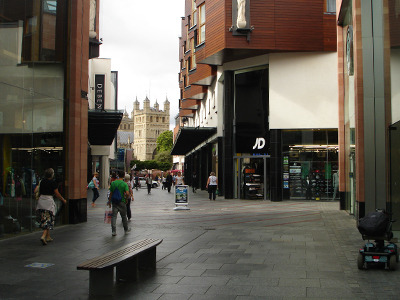 Of course the shops and restaurants are the same and most of the architecture too is standard shopping centre issue, but it does make a big difference that this standard kit is disported around proper streets and spaces which are part of a bigger outward looking picture. 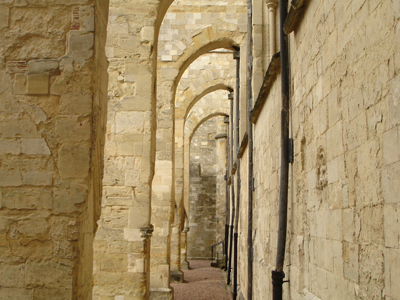 Views of the Cathedral are maximized and new spaces frame a section of the old walls and create an attractive relationship to Georgian Southernhay. Car parking and servicing are well handled so there is no real backside – even the car park elevation is quite carefully considered. The spaces flow seamlessly into the 50s High Street and what I liked particularly was what I took to be the referencing of the character of the usually utterly dismissed post war buildings, for example the ‘festival’ style of the new Debenhams building and the oval Next, echoing a nice circular arcaded shop at the corner of Paris St. A lot of creative thought has gone into this development at least by most of the architects, although at times it is dragged back to the formulaic like the sneaky way some of the side ‘streets’ become malls. 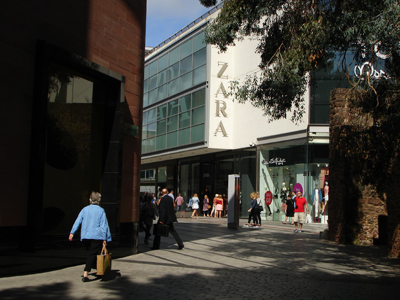 Overall probably about as good as it gets and on a sunny day Exeter was clearly enjoying it as urban and social spaces, not just a shopping machine. Eat your heart out Southampton, Derby and all the other victims of mall-omania. 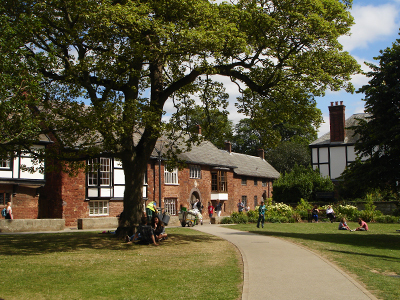 Southernhay, with its fine Georgian terraces and central gardens, skirts the city walls and enfolds the Cathedral precinct and Princesshay. 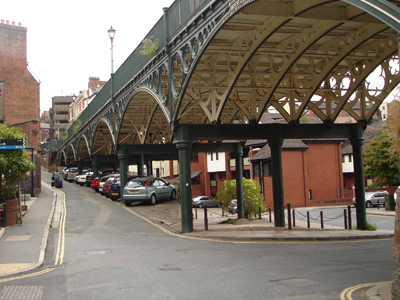 That it still retains its character owes much to Sharp who fought off attempts to make this an inner ring road. (His plan for a ‘Freeway’ along the northern walls was thankfully not executed.) Western Way is the relief road that got built and it manages to do a great deal of harm cutting through the walls and creating a formidable barrier between the Cathedral, Southernhay and the Quayside. Pedestrians can partly follow the walls using a footbridge across the new road. Circular brick stair towers, presumably the ghosts of demolished barbicans, connect to the streets, a nice touch. However the route to the Quay becomes confused. One thing Southampton could teach Exeter is how to use its walls in a more imaginative way. 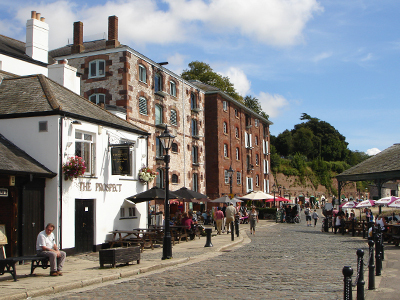 The broad cobbled Quay is delightful, set at a bend in the wide river and below an impressive sandstone cliff. Above the cliff are attractive stucco terraces. You come first to the lovely Customhouse of 1680, beyond which is a mummery pub and opposite this open iron sheds against the water. Georgian and Victorian warehouses are hard up against the cliff, now converted to residential and rather crudely linked. Across the river further warehouses are converted to a maritime museum, which can be reached by a chain ferry. There is also a new pedestrian bridge to the far bank which accommodates the obligatory waterside regeneration of the usual witless kind. Here the bridge leads directly to a grand central axis - which is gated and barred. The public must skirt round the outside of the oval development which holds itself primly behind raised walls. 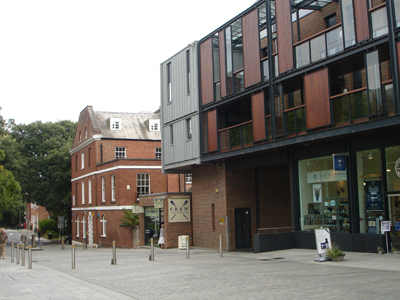 The relationship to the canal basin is more successful, with a new piazza and cafes. Opposite is a much more pleasing building, a modern interpretation of a waterside shed used for water activities. Together with views of decent stuff across the canal basin and the river this make for a pleasant space. 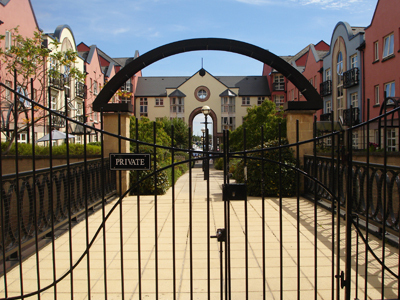 Back across the regeneration bridge at Friars Green is some excellent earlier regeneration – a dense low rise public housing scheme in red brick with grey tile hanging grouped cleverly around four courts which give onto riverside lawns, showing that the 1970s have lot to teach us. 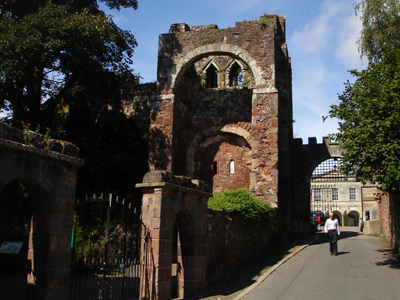 Rougemont Gardens are laid out around the city walls and the fortifications of Exeter Castle, which retains a formidable red stone Norman gatehouse, the best preserved in the country. Not much else remains of the castle but it provides the picturesque setting for the elegantly restrained stone fronted classical law courts of 1774. Rougemont House near the gatehouse is graceful Georgian with two shallow bows and delicate ironwork balconies above. It bears a Civic Trust plaque recording its restoration but a few decades on looks sadly neglected. 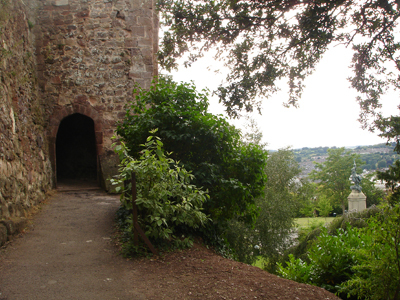 The city walls are punched through to link into Northernhay Gardens from where you get a great view of Exeter in its countryside setting. 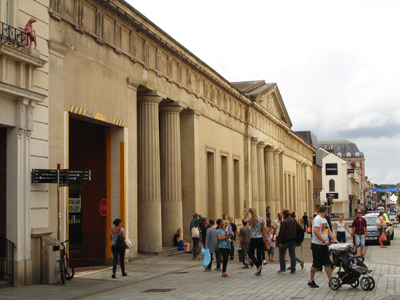 In Queen Street you also find the ‘Wrenaissance’ Central Station built by the Southern Railway in 1933 and if you continue north following the excellent pedestrian signs St David’s Station is about a kilometre further. 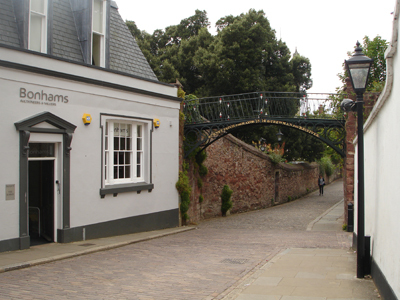 A more direct route takes you along North Street past the mooning backside of the Guildhall shopping centre and over Iron Bridge which crosses a steep valley. The cast iron bridge of 1835 has immensely thin supports and Gothic balustrades. 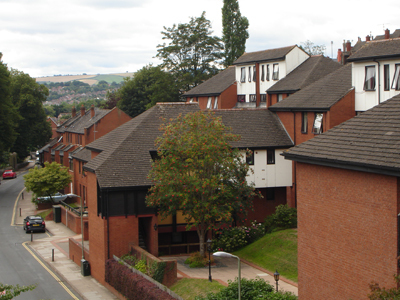 Below is an interesting looking 70s social housing scheme making good use of the complicated levels. 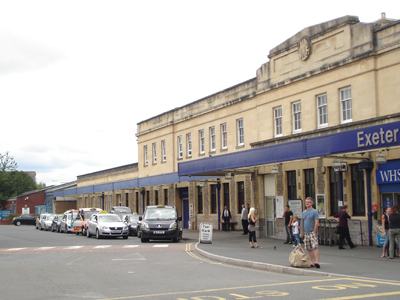 St David’s Hill takes you to the station which is not Brunel’s original but it has an impressive long Victorian façade in front of which the GWR inserted a streamlined structure like Cardiff in the 1930s. 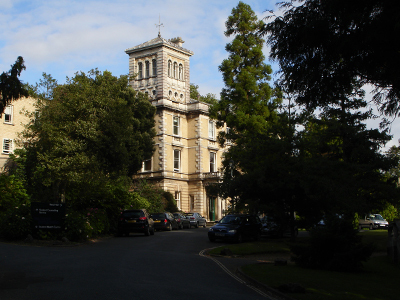 It is worth continuing a kilometre or so further to Exeter University, set in an extensive hilly campus, not unlike Nottingham University in its inscrutable layout and also in its architectural conservatism. Exeter is of course known for its Sloaneranger students so it is maybe not surprising that your first encounter is with what looks like Lutyens’ interpretation of Jacobean. It is in fact ,Vincent Harris’s 1931 Washington Singer Labs. He also built the chapel, the original library and the Hatherley Labs, but this is more austere post war Georgian. 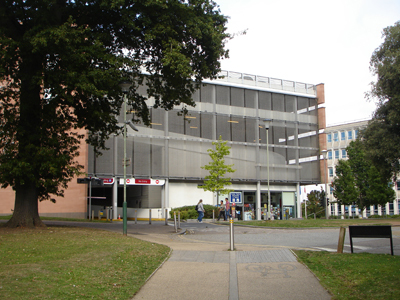 Queens Building by William Holford of 1956 is modern in style but not very special. More interesting is his Devonshire House which is looser Scando-modern with nice details and a sweet campanile. 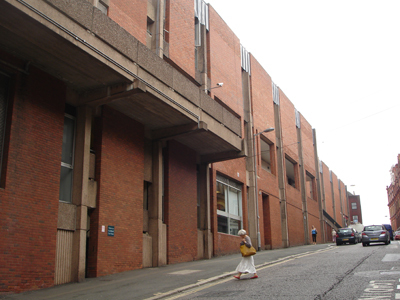 The 1967 Northcott Theatre and adjacent slightly earlier Great Hall, both by Holford, are bold and confident compositions. The heavy purple brick new Library by John Crowther, 1981, is arrogant rather than confident but you can get away with a lot by hiding behind landscaping in such lavish parkland where one stumbles across Barbara Hepworth. 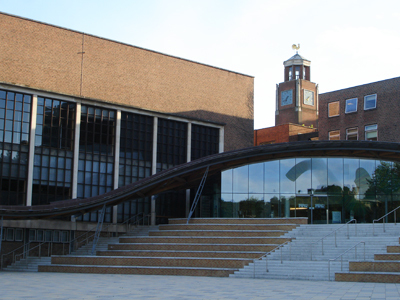 These latter buildings have recently been linked by a new structure, the ‘Forum’ designed by Wilkinson Eyre. This has an undulating gridshell roof, its fluid form a contrast with the orthogonal brick volumes, as the architects put it. A new plaza has also been created and the idea is to create a central focus for the scattered campus, which is badly needed. Broadly it seems to work well but the wavy foyer in front of the Great Hall does take some of its dignity. 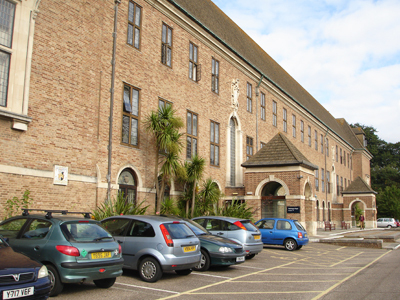 Exeter University is now hugely important to the economy of the city as is the Met Office which relocated here in 2003. The Met Office HQ is a Broadway Malyan fancy box with pointy things in a big car park near an M5 junction. There was a big fuss with CABE about the design – they preferred an Alsop alternative. Bizarrely it won the ‘best office building of the year’. But the real issue is why a government agency, which surely should appreciate climate change, is located in such a totally car dependent place with just an hourly bus service to St David’s? Even under Prescott sustainability was only window dressing. God help us now. ....and its good suburbs (Pennsylvania). Exeter is a similar size to Lincoln. Both are the shire towns of large rural counties, historic cities, cathedral towns and now with important universities. They have very different characters but both are success stories in different ways. Both have recently promoted some good architecture and planning and shown a strong sense of civic pride as with their new museums and promoting more pedestrian and cycle friendly streets. 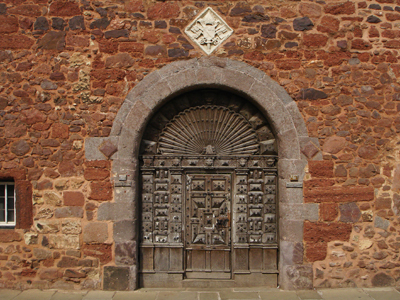 The Phoenix envisaged by Thomas Sharp may have been frustrated by mediocrity but Exeter today has a lot going for it. 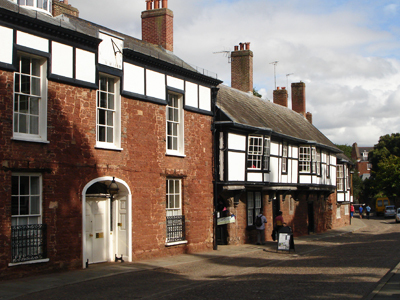 A fascinating and insightful observation of the beautiful city that is Exeter, its history, places, spaces and architecture. A very interesting article. But ... 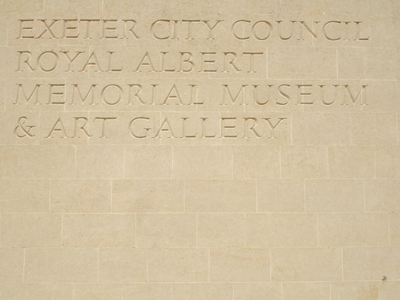 I live in Exeter and the city was almost totally destroyed by the city council after the War. You mistakenly consume the city council propaganda about how enemy bombing destroyed a large chunk of Exeter in 1942. Not true; Bedford Circus - the jewel in the pre-war Exeter crown - was partially damaged by bombing in 1942. But, it could easily have been saved. Instead, the council tore it down. Surviving post-bombing photographs confirm this to be true. Same with the prestigious Lower Market; yes, it suffered bomb damage but, again, it could easily have been saved. 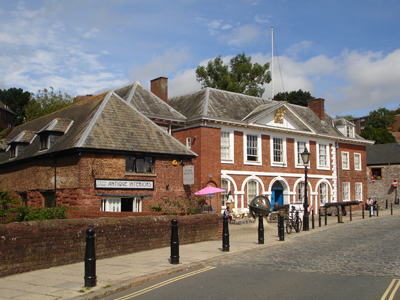 Exeter, in fact, had two prestigious under-cover markets in the style of Covent Garden, in London (by the same architect, Charles Fowler). The Higher Market - some of which survives, including the classical façade on Queen Street - was about two-thirds destroyed as late as 1972 by the city council. That included picturesque Goldsmith Street and Pancras Lane. 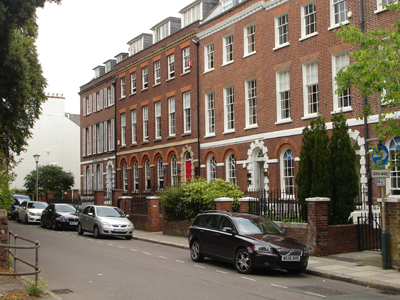 Other streets - such as Sidwell Street, South Street, etc. - were routinely torn down, only to be replaced by disastrous, anonymous post-war dross. Finally, I refer you to the sensationally brilliant Demolition Exeter website. Look it up! !